Ethernet Extension—Extend 10/100Base-TX Ethernet up to 10,000 feet (3 kilometers)—well beyond the 328-foot (100-meter) limitation—over a single twisted-pair, Cat 5e/6/7, or even coaxial cable. Operates Over Twisted Pair—Realize fiber-optic speeds without the expense—and hassle—of installing new cables or line-of-site wireless circuits. Multiple Line Rates Supported—Boasting downstream line rates up to 168 Mbps, the switch-selectable rate mode options optimize rate and reach for the noise environment, wire gauge/type and length. Perfect for bandwidth-intensive applications the Model 2174 delivers off-the-chart symmetrical line rates greater than 100 Mbps. Best of all—like all CopperLink™ products—the Model 2174 leverages existing copper infrastructure to deliver high speed Ethernet connectivity over voice-grade twisted pair, Cat 5e/6/7, and—new to the CopperLink™ line—coaxial cabling. 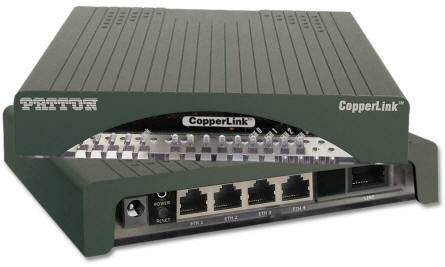 A built-in 4-port Ethernet switch makes the CopperLink Model 2174 ideal for delivering multiple IP information streams over a single cable. For example, at a guardhouse or security kiosk, you could aggregate IP data from a laptop, a motion sensor, and two high resolution IP video cameras for simultaneous transmission over a single Ethernet connection. Combining data flows from up to four network-enabled devices onto a single twisted pair or coax cable, the Model 2174 can deliver IP traffic up to 4,250 ft (1295 m) away—well beyond the standard 328-foot (100-meter) Ethernet distance limitation. With achievable line rates up to 100 Mbps, the CopperLink 2174 eliminates the bandwidth constraints commonly experienced with other copper-based transmission technologies. The Model 2174 is engineered to re-use existing infrastructure previously employed in legacy applications including alarm circuits, E1/T1 circuits, RS-232, RS-422, RS-485, CCTV and CATV. Many newer cabling standards are also supported, including Cat 5e, Cat 6 and Cat 7.